It was one of the things I most wanted to see while visiting the city. Don’t mock. You can learn a lot about a place by the state of its sub-surface public transport network. 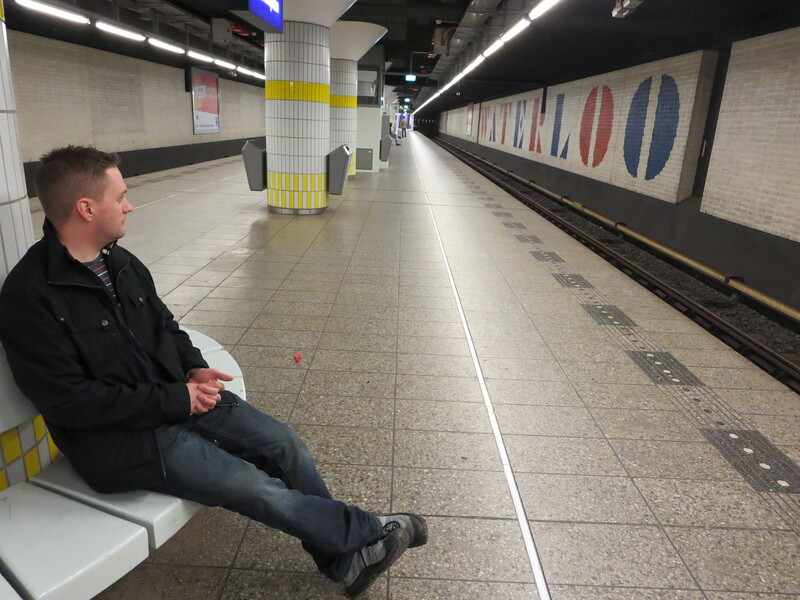 Well, that’s what I told Robert, as I dragged him along for a ride on one of Amsterdam’s four Metro lines. If he didn’t believe me, he was polite enough not to say so. I found the light, airy feel of Waterlooplein instantly appealing. 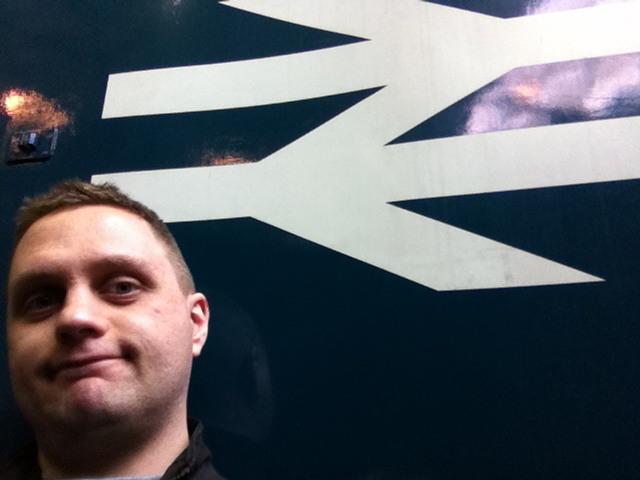 It was spacious and clean, completely intuitive, and blessed with very swish giant lettering running along each wall. The place looks fairly deserted in this picture, but don’t be deceived. Everyone else was bunched up the other end. For yes, the British public’s enduringly barmy habit of clustering around the bottom of a flight of steps rather than spreading out all along a platform is one that has taken root on the European mainland. Did we catch the disease from them or did they give it to us? Perhaps we’re all carriers, and have been incubating the virus for generations ever since one man in 1830 decided he could no longer be arsed making room for the person standing behind him. I also noted, with a wry sigh, that the Metro’s passengers are guilty of getting on to trains before people have finished getting off, and then hovering by the carriage doors instead of, yes, spreading out all along the inside. Tsk. Was the Maastricht Treaty signed for NOTHING? The bit of the Metro we sampled is about the same age as me. I’m not sure who looks in the better condition. This section, the Oost line, links the city centre with clumps of suburbia to the south-east of Amsterdam. 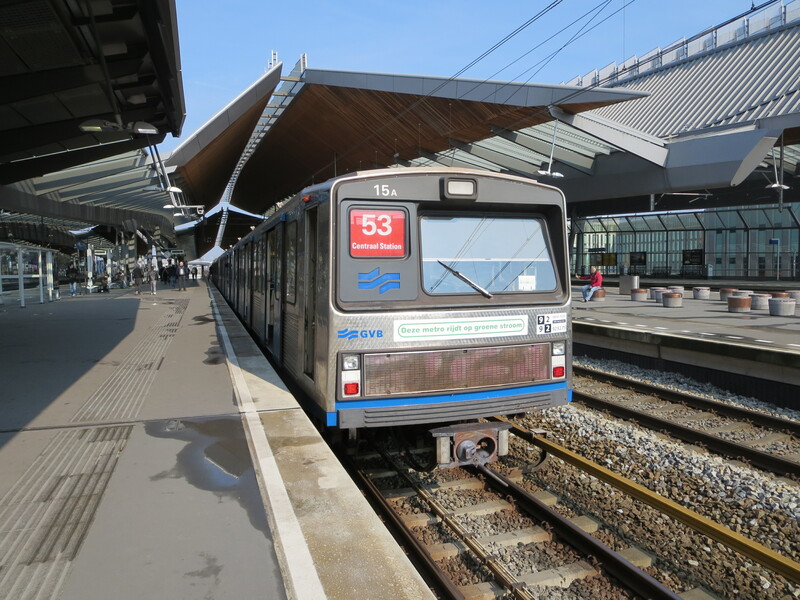 We rode line 54 a total of seven stops, getting off at the spectacular Bijlmer Arena station. 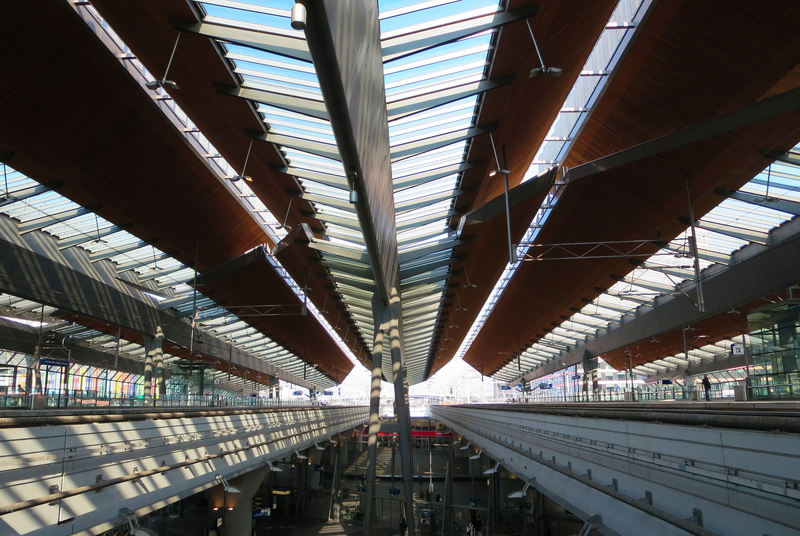 I’d read that this had been recently rebuilt, to a design by Grimshaw Architects of London – the same people who did the now defunct international terminal at Waterloo station, the National Space Centre in Leicester, the Eden Project in Cornwall and a slew of other architectural gems. We loitered here for a while, mooching both in and outside the spectacular complex. Ajax football stadium was nearby, complete with what looked to me like a motorway running through the middle. A couple of music venues were also in evidence, one of which sported a 10-storey high picture of Sir Tom Jones. Empty of people and atmosphere, it all felt somewhat soulless – a bit like the area around the Millennium Dome. I preferred being back inside the station, where the buzz of passengers and parade of dapper if eccentric-looking trains made for quite a spectacle. How long did we linger in this palace of delights? As soon as you could say Gemeentelijk Vervoerbedrijf, we were on our way back to the city centre. I hadn’t travelled all this way just to pretend I was in a scene from The Ipcress File. Eventually, however, we got lucky. 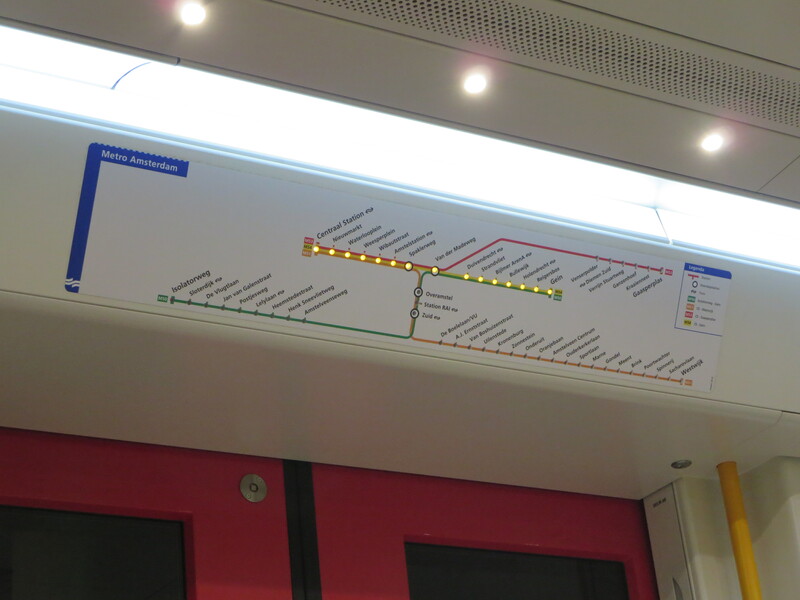 And I can reveal that Amsterdam has utterly outflanked London in the who’s-got-nicer-newer-trains stakes. Look: a diagram with flashing lights! Now don’t misunderstand me: the London Underground is still the finest of its kind in the world. I can think of 150 reasons for starters. But to step into the Metro’s latest fleet of carriages was like climbing aboard one of those “here’s the future!” exhibits in the London Transport Museum. Only this one actually got made real. A shame, then that the seats were just moulded plastic and didn’t have any padding whatsoever – let alone a moquette. What price a brave new world without cushions? Perhaps I shouldn’t be too harsh. For this particular underground scene is still growing. 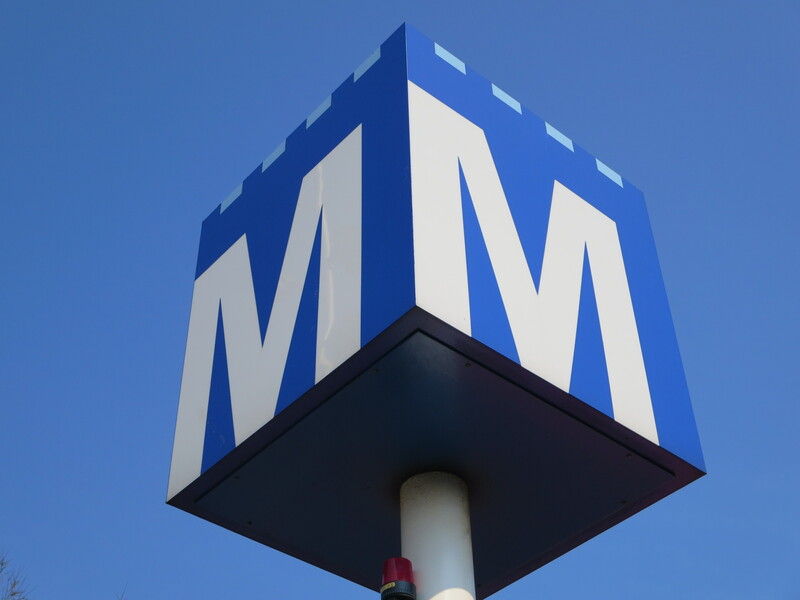 Amsterdam’s Metro network, as originally conceived, hasn’t even been finished. After a mighty delay of over a decade, the fifth and final line is at last being dug. 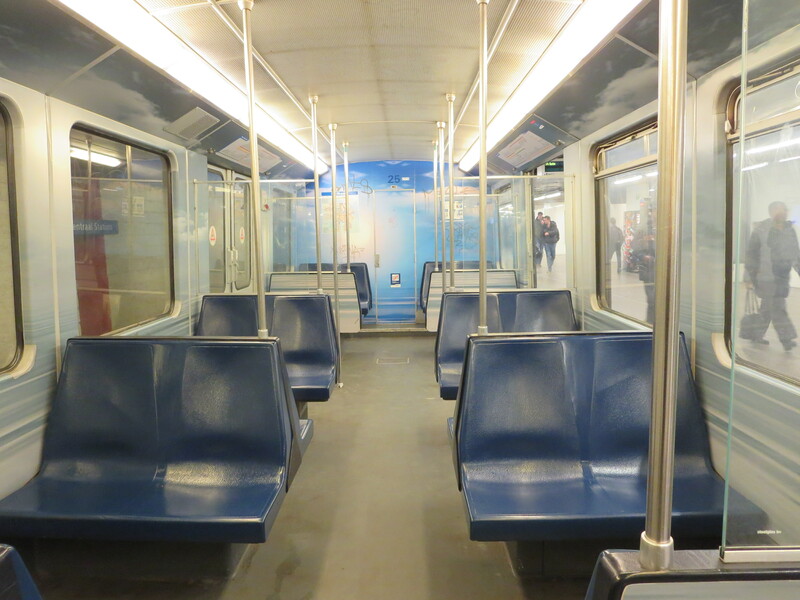 Fancy that: an entire brand-new underground line in one of Europe’s busiest cities. The European hatred of cushions on their metros is a constant source of frustration to me.